PLEASE COME AND MEET YOUR FELLOW SEPAC PARENTS! “Woman-liness – From Little Women to Nancy Pelosi” – a Conversation Circle launch! Concord, Massachusetts, is a wonderful little town to live in. With its close proximity to Boston, it is ideal for people who want to be close to the city but want to enjoy the friendliness and sense of community that Concord offers. Concord is a lovely town for families, history buffs, outdoor enthusiasts, and for those who want to be involved with the community. Lexington and Concord are known as the places where the American Revolutionary War began. A beautiful bronze sculpture by Daniel Chester French commemorates this historic event. Founded in 1635, Concord was the first inland settlement to become incorporated in the state of Massachusetts. On April 19, 1775, the “shot heard ’round the world,” commencing the beginning of the War for Independence, was fired here, and many consider Concord to be the birthplace of the nation. In the late 1800s, Concord was transformed into a town and destination for some of the nation’s greatest philosophers, writers, and poets to write and complete their famous works. Today, those who live in Concord have access to wonderful museums, schools, community centers, libraries, and recreation centers. For information on things to do in Concord, Massachusetts, such as community programs, school events, festivals, and seasonal festivities, check out Living Concord’s listings often. The local Concord community has a strong bond that connects its residents, and this bond is proudly reflected in the work of the Concord-Carlisle Community Chest. Here you will find neighbors helping neighbors. The Community Chest helps to identify nonprofits, local projects, town agencies, and individuals who can use financial support. Among the many philanthropic projects at the Community Chest, one that stands out is the Carlisle Council on Aging, which helps to support and serve older adults on issues associated with aging. Another, the Center for Parents and Teachers, provides workshops and forums to help teachers and parents discuss topics associated with having children in school. A library of reading material is always available along with child care during workshops and training sessions. Through diligent research and resourcing, the staff and volunteers at the Community Chest find financial resources to fund many community projects. 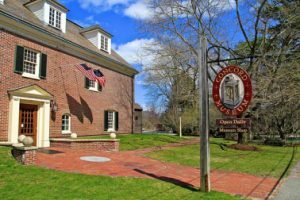 To begin your journey exploring things to do in Concord, Massachusetts, head to the Concord Museum. Here you will find a vast collection of exhibitions, national treasures, artifacts, and other memorabilia from the War of Independence and early colonial life. Inside the museum, you will find rooms that are carefully interpreted with furnishings of the early period of the nation’s history and founding. A special collection highlights writer Henry David Thoreau, with many artifacts from his life living near Concord and Walden Pond. You can see some of his personal items, furniture, books, photographs, and manuscripts that he kept with him. It is a rare experience to be able to glimpse an intimate side of such a famous author and philosopher. Throughout the year, the museum hosts special exhibitions on loan from other prestigious museums and galleries from around the country. Check the calendar for information on these special exhibitions. The museum is also pleased to host a lineup of historic and cultural events throughout the year. From the Mary M. Lesneski Memorial Lecture & Tea social to the historic Patriot’s Ball, the Concord Museum provides many opportunities to learn about the history of Concord. To further learn about the history of the Concord area, stop by the beautiful Concord Free Public Library. The educational information available to you at the library is not only vast but also fun and lively. Participate in a book club discussion, join the cookbook club, enjoy family story time, and have fun in a toddler sing-a-long. One of the highlights of the library is the Special Collections section. Here you will find an extensive collection of printed books, manuscripts, and archives pertaining to the Revolutionary War. According to the library, they have the most archived and historic materials related to Concord’s history from 1635 to present day. For anyone who has read the inspirational book “Walden” by the famed philosopher and naturalist Henry David Thoreau, spending time at Walden Pond and the surrounding woods can be a divine experience. On July 4, 1845, Thoreau decided to build a cabin in the woods near Walden Pond on land owned by his lifelong friend and philosopher Ralph Waldo Emerson. At this time, Thoreau wanted to spend time communing with nature in a quiet, meditative way. He wanted to live a simple life and write about his experience, thoughts, and feelings. Thus, “Walden” or “Life in the Woods” was created. In 1922, the Emerson family, who owned Walden Pond and the surrounding woods, granted the land to the Commonwealth of Massachusetts to preserve the pond, woods, and nature for all members of the public to enjoy. Today, Walden Pond State Reservation is open for hiking, bird watching, swimming, boating, picnicking, and winter activities when the snow falls. If you are looking for organized activities, the Concord Recreation Department offers a variety of classes for youth, adults, and groups. Kids and adults alike can participate in dance or music classes, sports activities such as martial arts, and art classes. Fitness classes are held in the state-of-the-art fitness center with a range of resistance machines, free weights, and cardio machines. Personal training sessions can be booked for a nominal charge. For aquatic fitness, the Beede Swim and Fitness Center offers classes for all levels. The pool is also open for public use for family fun time. Inquire into membership fees and day passes with the Concord Recreation Department. If you would like to experience what a fife and drum corps sounds like, hear a canon or musket being fired, and watch a brigade of minutemen marching, you will not want to miss April’s Patriot Day’s Reenactment in Concord. The living historians are dressed in period-attire uniforms, and as the soldiers march over the North Bridge and down the famed Battle Road, you will feel as if you are in the heart of the battle that began the American Revolutionary War. You’ll discover fast-paced battle reenactments, weapons demonstrations, ceremonies, marching, and “civilians” dressed in colonial-era costumes. For Revolutionary War history buffs, the Patriots Weekend is a must-do at the Minute Man National Historical Park. The Concord Community Arts Center, known as The Umbrella Community Arts Center, is a special place to bond with residents of the Concord community through arts, education, and community collaboration. The arts education program provides a variety of classes and workshops for adults, youth, and children. Learn how to draw, paint, or sculpt. Or try a movement class of yoga or dance. All of the classes are taught by professional educators, instructors, and artists, and they offer a fun and safe way to learn the arts. Experience the magic of The Umbrella performing arts program with live plays, musicals, and storytelling through drama and theater. You’ll find Concord, Massachusetts, events for everyone in the family to enjoy here. For those who love birding, local wildlife, and hiking through the wetlands, the Great Meadows National Wildlife Refuge is a gorgeous place to visit. See freshwater turtles, great blue herons, muskrat, and a host of resident and migratory waterfowl. The refuge stretches along the Concord and Sudbury rivers and is managed by the U.S. Fish and Wildlife Service to help protect and maintain this vital environment. Bring a pair of binoculars and a camera and capture the raw, natural beauty of one of America’s great wetlands. You’ll discover many wonderful things to do in Concord, Massachusetts. Discover the colorful beauty of the fall foliage as you drive the back roads around Concord. Take a trip to one of the many local farmers’ markets and farmsteads to get a taste of home-grown produce, cheeses, and maple syrup straight from the trees of New England. Through every season, you will find special events in Concord. Spring is full of events including the Patriots Day Parade and Patriots Weekend. In summer, head to Walden Pond to swim, boat, and contemplate nature. Fall is perfect for viewing the changing colors of the trees and a great time to visit farmers markets for pumpkins. Winter brings a special magic to Concord. The trees have lost their leaves, and the snow falls quietly in the forest as mist rises from the rivers. Enjoy a bit of Christmas spirit in town with the historic buildings brightly decorated and carolers singing along the snowy streets. Enjoy the local farms while sipping hot cider as you pick out a festive wreath or Christmas tree for your home. Throughout the year, Concord is a delightful place to live. The town has wonderful shopping and dining, as well as arts and community-based organizations. Living Concord’s calendar will help you find events and things to do in Concord, Massachusetts.